Tagbilaran City, Bohol - The San Antonio Spurs are off to the Western Conference Finals after a 114-75 thrashing of state rivals Houston Rockets in Game 6 of their best-of-seven playoff series in Houston. Missing two former Finals MVPs in Kawhi Leonard and Tony Parker to injuries earlier in the series, Gregg Popovich's wards banked on a very disciplined defense and solid teamwork to frustrate top MVP candidate James Harden and his Houston Rockets from start to finish. LaMarcus Aldridge posted a double-double with a season high 34 points and 12 boards to lead the Spurs. Five other Spurs also scored in double figures. 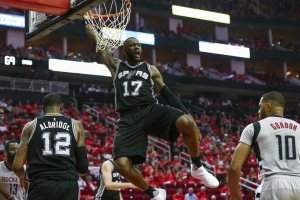 Jonathon Simmons filled in for Leonard in the starting lineup, hounding and frustrating James Harden who was limited to a season low 10 points on a 2 for 11 field goal shooting and 6 turnovers. Simmons lit it up for the Spurs with 18 markers on top of 4 assists and a steal. The Spurs asserted their size advantage with a 60-37 rebounding edge throughout the game. Their ball movement was also telling with 32 assisted field goals, while the Rockets can only muster 14 of their own. Efficiency also did it for the Spurs, as they committed only 7 turnovers and shot 53% from the field. Up next for the Spurs are the top-seeded team Golden State Warriors for the best-of-seven Western Conference Finals in a battle of this season's top two teams.